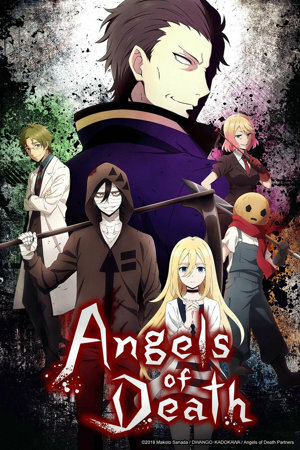 Distributor: Currently licensed by Kadokawa USA, also available streaming on Crunchyroll. Notes: Based on a game by Hoshikuzu KRNKRN (Makoto Sanada), released by Den Fami Nico Game Magazine. The whole setup of the show- defeating various adversaries as you work your way through various levels- pretty much screams "Game", so I was not a bit surprised when I looked this up on Wiki after the viewing, and found it started out as exactly that. As a horror/suspense show it's actually a bit disappointing. Granted, there's plenty of blood (mostly Zack's; over the course of the show he'll bleed out about six bodies' worth of blood, and somehow keep going); but most of the adversaries get dispatched rather quickly (well, one, named Catherine Ward, lasts a few episodes, and some or all of them may return in one fashion or another), and I was wondering how they could make this go the 12 or 13 episodes of a standard series; it never even occurred to me that they'd end up going to 16. But remember I said that I wondered how they'd make this run even a standard season's length? The show pads like crazy. Personally, I might have actually liked to see some characters get a bit MORE time (like that kid in the pumpkin mask, Eddie Mason); but I would have SEVERELY cut back the "screen time" of that "priest", named Gray, who seems to be this place's emcee. The show obsessively goes on about "sin", turns ever more hallucinatory and surreal (and not even interesting hallucinatory and surreal), eventually throwing in a pointless, dilatory "witch trial" for Rachel- which mainly seemed to exist as an excuse to bring back characters that the show had, itself, shoved off the stage too soon. This sort of thing goes on for about TEN EPISODES, and while it does finally fill in all the blanks in Rachel's and Zack's pasts, things end up moving SO slowly, and getting SO stretched out, that some in the audience might begin to think of making the same pact with Zack that Rachel did, if it would end their OWN misery. We even wind up with one of those scenes of people partaking in calm (and, alas, pretentious) discussions in a burning building, which, as I've said before, I'm not sure is even humanly possible. The only other thing I'm noting here is that the closing theme rather reminded me of the closer of the first season of Higurashi- which is my rec here, since it's also got its share of psycho killers. Recommended Audience: Extremely violent, including domestic violence; extensive bloodshed (including some self-inflicted.) Movie R/ TV-MA. The show definitely goes with the idea that horror movies can encourage imitation.